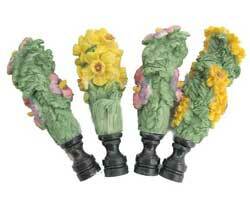 Or lampy flowers, we're not sure. We do know these ceramic lamp finials (the thingees that hold the shade on) are sweetly colored bunches of flowers, about 1" dia x 3" tall. Our each is a box of (4) including (1) each with yellow chrysanthemums, yellow daffodils, rose, purple and yellow tulips, and rose and purple somethings which we think may sort of be pansies. All have green leaves around the flowers. Very pretty, but we suggest you do not use them with a hi-tech decor. 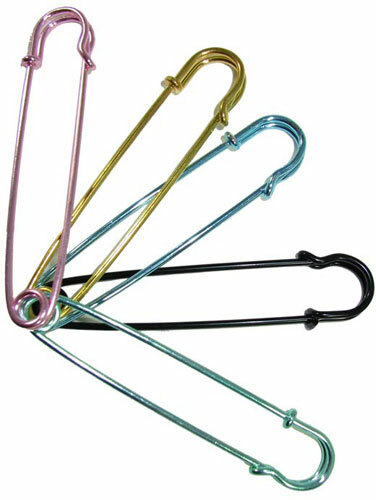 These big, 4" long steel safety pins are practically jewelry in their own right. You get a 5-pack in assorted colors--gold, black, metallic pink, blue, green or others. Perfect for closing buttonless sweaters and tops or securing scarves in fascinating configurations. In Surplus World, it often does. 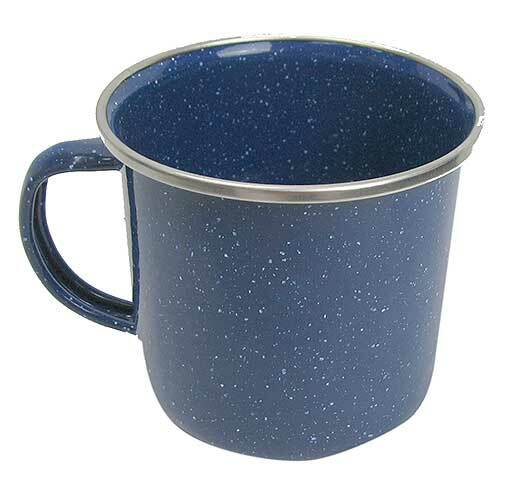 That teensy error on the cardboard tag brings you this snazzy blue-speckled enameled steel coffee mug, the sort that legions of prisoners have dragged along the bars of their cells in legions of movies, at a price that is freeing. Maybe has a cowboy look to it, too. Holds, yes 10 ounces, and measures 3-1/8" x 3-3/16" dia. 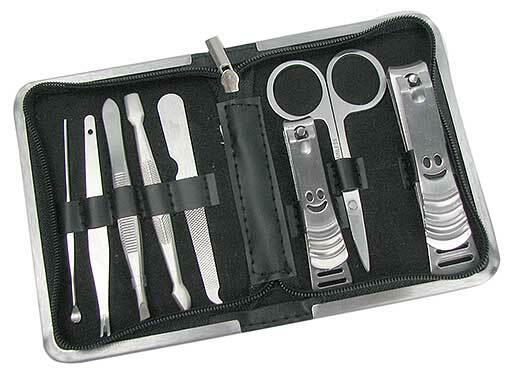 Make your fingers (and toes, too, if you can reach them) twinkle with this compact 8-piece stainless steel manicure set. Includes small and large nail clippers plus 3-1/4" long curved cuticle scissors and, in the same size, a cuticle pusher, trimmer, tweezers and a nail cleaner. All in a zippered imitation faux leatherette pouch. Got boring throw pillows? We feel your boredom. Try these 18” square (a common throw-pillow size) nylon pillow covers to bring a touch of whimsy to your couch. 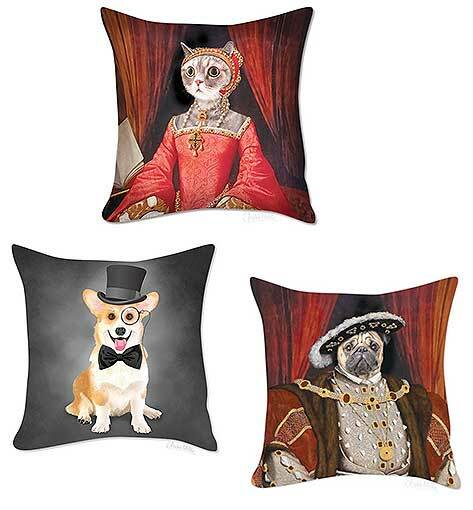 You pick: the pug dressed as Henry VIII, as they will if left to their own devices; the cat dressed as Henry's daughter, Elizabeth I; or the corgi with top hat, bow-tie and monocle, which they wear when the queen’s not around. The flat vase is 10-1/2" tall and made of thin formable plastic, flat enough to keep in a file folder, or to fold and put in your pocket when you're carrying roses somewhere. Fill it with warm water and mold it to the shape you want, empty it and fill it with cold water to hold that shape; add flowers. 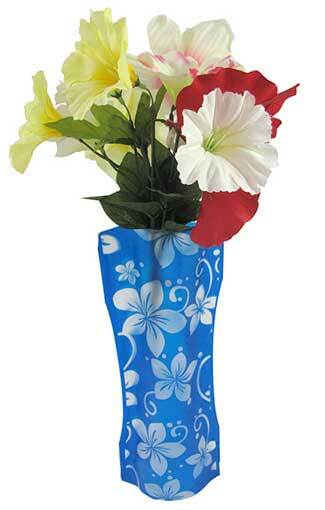 Ours are a lovely white and green, blue, or red floral pattern. Here on the prairie we resent the calling of those things one puts under a glass "coasters". Why should the ocean fronts always get the credit?? So we are offering these roughly 3-1/2" sq. plastic devices under the inland name of "plainsers" You will get (8) all the same color of our choice, be it orange, brown, gold, black, silver or clear. We say square, but the sides are slightly convex out. Kind of like our midriff. An excellent value under any name. Got his-n-hers soap? 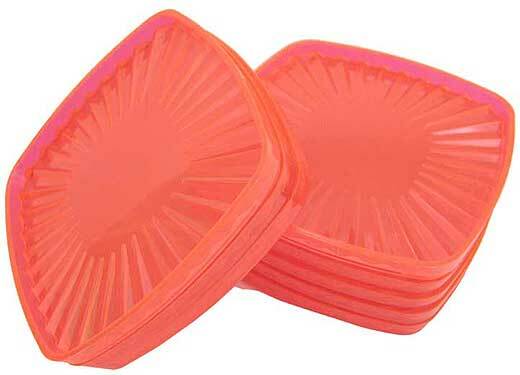 Add this double soap dish to your shower and your soap-stacking days are over. Measures 9" long x 4" x 7/8" with drain slots to prevent gloopinated bars of soap, and mounts via a pair of suction cups to save you from having to drill holes in the tile. 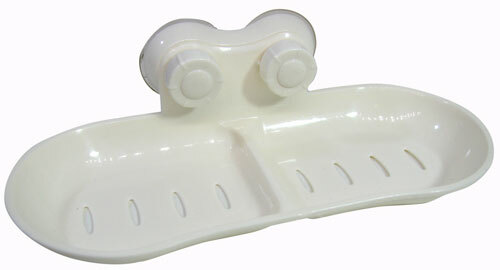 In cream/off-white plastic. Also suitable for dry-docking his-n-hers rubber duckies. Think: cartoonish cute. 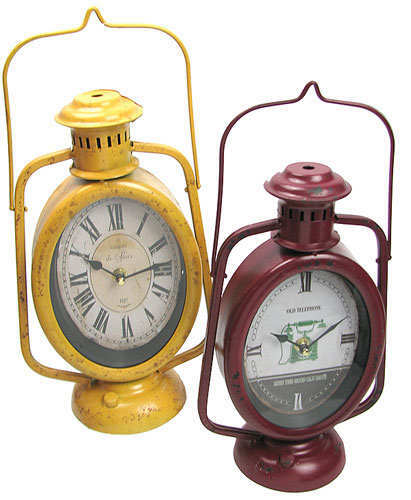 These table or hanging clocks are made as if from the body of a kerosene lantern, but flattened. In painted steel, they measure approx a foot tall on on a 4-5/8” round base, not counting the wire swivel handle/hanger on top. A 6-5/8” x 4-3/4” oval glass covers an antiquey Roman numeral face. Distressed for a vintage look, they run on a modern quartz movement that moves when you stick a “AA” battery in it. We’ll pick one for you in deep burgundy or a goldenrod yellow to go with that sweater you love. 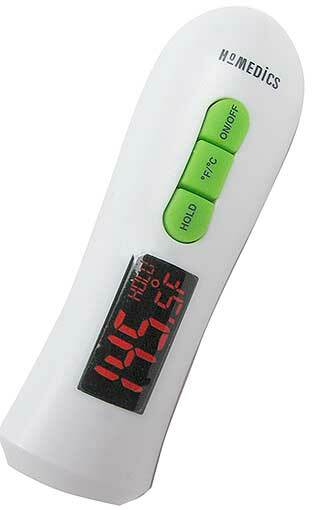 Pardon us if we don’t swipe right, but we’re just selling digital thermometers here. This one, from HomeMedics®, is 8” long but the 3-1/2” probe folds away and tucks into the 4-1/2” long handle. Readout is 1” x 1/2” LED display, shows -40 to 450F, -40 to 232C, and has a hold button to freeze display. Made for cooks, but because of its wide temperature range it doesn’t really care what or whom it’s measuring, heat-wise. Powered by a pair of common CR2032 batteries (included).